This new piece from Kingston Brass brings fresh water fast and adds a stylish look to any bathroom. You'll enjoy the easy use and modern design of this dual-control faucet. Make your sink look even more beautiful with this item's easy-to-install deck mounted design. This faucet is also WaterSense certified to help you and the environment stay clean. Redefine traditional styling with this Margaux bathroom sink faucet, which features a strong modern design that commands attention. 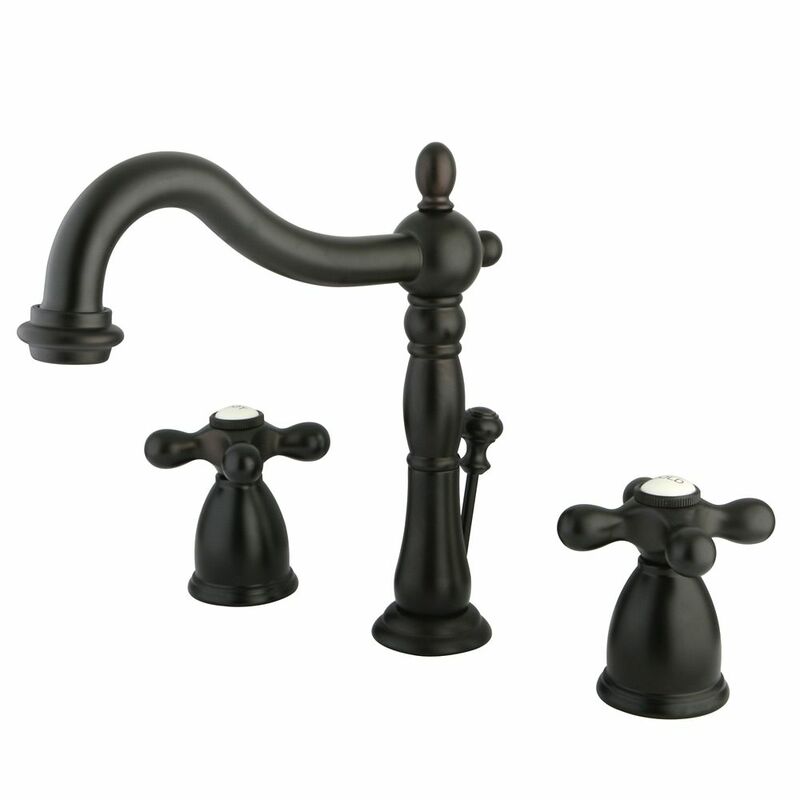 This bath sink faucet comes with bold, ergonomic cross handles and Margaux's subtle pillow-top detailing. Outfitted with easy-to-install and leak-free UltraGlide(TM) valves, this faucet is designed for precision and reliability as well as style. Victorian Widespread (8-inch) 2-Handle High Arc Bathroom Faucet in Bronze with Cross Handles This new piece from Kingston Brass brings fresh water fast and adds a stylish look to any bathroom. You'll enjoy the easy use and modern design of this dual-control faucet. Make your sink look even more beautiful with this item's easy-to-install deck mounted design. This faucet is also WaterSense certified to help you and the environment stay clean. Victorian Widespread (8-inch) 2-Handle High Arc Bathroom Faucet in Bronze with Cross Handles is rated 4.5 out of 5 by 17. Rated 5 out of 5 by GS3 from Very solid, sturdiest faucet I have ever installed. Little more... Very solid, sturdiest faucet I have ever installed. Little more work than most to install, but truly solid brass everywhere, has some weight to it, will last a lifetime I am sure. Looks great too. Rated 5 out of 5 by TinerMom from Stunning piece!!... Stunning piece!! Rated 1 out of 5 by Pedro from NO WARRANTY IN CANADA Called warranty number listed on Canadian website to be told flat out the warranty does not apply to Canada. Very poor service indeed. Rated 5 out of 5 by Bartgas from Easiest plumbing fixture installation ever! Well designed. Easiest plumbing fixture installation ever! Well designed. Rated 5 out of 5 by HomeDepotCustomer from Beautiful, heavy metal and appears high quality, would buy again!... Beautiful, heavy metal and appears high quality, would buy again!